The only comfort that December brings is the ending of November, the opportunity to light candles and to uncork a bottle of summer. Camille Braun, located in Orschwihr, has received much and well-deserved attention from La Revue du Vin de France. This charming domaine offers a lot of class at very reasonable prices, regardless if you are a big importer or a private, visiting customer. 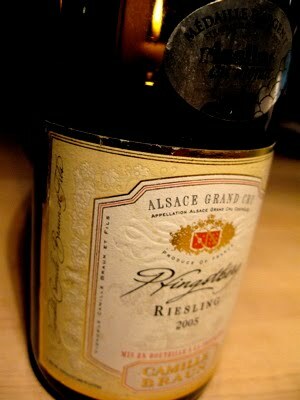 2005 Riesling Grand Cru Pfingstberg offers camphor, ripe yellow apples and kirsch on the nose. The taste is rich and full, yet the aftertaste has very good structure, great acidity and a sandy minerality. A winner!